Registration for SouthWest Music School classes in the 2018-2019 session is now open. My child was a student last year. My child brought home a flyer from school. optional - only if you want a second address to receive notices, newsletters, and other email from SWMS. We will not sell any email addresses to 3rd parties. Any health concerns we should be aware of? SW Music Schools relies on parent involvement. Please share with us any special interests, skills or connections you have. For example: graphic artist to help with a musical program creation, a pianist to help accompany a piece during a concert, cookies for a concert, help putting up signs, or any other ideas you might have. Thank you. Elementary Violin (grades 1 through 5). Class sizes are between 5 and 10 students. 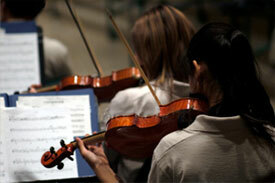 Middle and High Violin (grades 6 through 12), Thursday evenings (Chris Gaye instructing). Class sizes are between 5 and 10 students. See the "Classes" Page on this website for descriptions, locations, prices, etc. Middle and High Beginning Violin: Which Level? *Due to school closures on Mondays and Fridays, some classes will be moved to Tuesdays and Thursdays respectively. *If you have a PayPal account, you can use this account to pay. If you don't have a PayPal account yet, this option will enable you to use your credit card for a one-time transaction. The cost for the full school term, 30 classes plus the spring Grand Concert, is $500.00, except Chamber Orchestra which is $550. Of this, $50.00 is the non-refundable registration fee. $125.00 is due before a student may enter class, with the balance due by November 30. If you are registering for a class already underway, with teacher approval only, your class fees will be pro-rated. Your registration fee of $50.00 is non-refundable. Refunds will be made if you decide to withdraw from classes within the first 4 weeks of classes. Each class attended will be charged at $15, or $16.60 for Chamber Orchestra. Your decision to withdraw must be made in writing to: SouthWest Music School, PO Box 199, Beaverton, OR 97075 or by email to: office@swmusicschool.org. We would appreciate it if you could tell us the reasons for your decision. Click the Submit button below to be taken to PayPal. Please remember to put your child’s name in the “memo” field when processing your PayPal payment. Please make your check or money order out to South West Music School, in the amount noted above. Write your child’s name in the memo line of your check. Mail to PO Box 199, Beaverton OR 97075-0199.